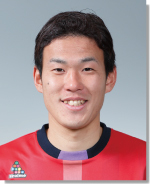 A player brought in on loan from Oita Trinita he has a playing history which includes being the first choice goal-keeper for an Oita Trinita team which won promotion to J1. A professional since he was 17 and now aged 25 with a promotion under his belt he would seem like a very good addition to the team and likely pick for first choice keeper, but the fact that after winning promotion to the top division Oita signed a new keeper tells it’s own story. Upon seeing Shimizu his biggest problem is obvious. While publicity material states he is 1.83m I think he must have had that measurement in his shoes as he is very small for a keeper and certainly doesn’t look that size when standing next to other people the same size. There are several teams in J2 who will aim balls into a big man in the box and I worry that he might not have the size to deal with it.